The station is well set up for tourists running Heli-Fishing tours for barramundi, riding, boat fishing, a swimming pool, even a massive boat called the Bootlegger, a boat with an engine and propeller that sounds like an aircraft as it negotiates the tidal part of river and its tributaries. It also has a smart bar and exclusive (by our standards) restaurant that needs to be booked at weekends. We camped at the river camp 4km away, with simpler facilities but views over the Pentecost River and Cockburn ranges that were magical as the sun sank in the late afternoon. The tidal movement was approximately 4-5m, with each low tide revealing a deep expanse of thick mud, lining each bank. In the afternoon sunshine a couple of saltwater crocodiles would haul themselves out and enjoy the solitude on the opposite bank, only interrupted by passing cattle and a myriad of wading birds including spoonbills, rajah shelduck, brolgas and much more. Our friends Marty and Crystal arrived and we soon had the punt sitting on the muddy banks. Fishing the river was a challenge, because once you negotiated the knee-deep mud, the water movement was so great it was hard to keep a sinker with bait on the bottom, outside of 30 minutes around the change of tide. Undeterred Marty and I tried trolling lures in every corner with limited success over two days. When a crocodile over a metre longer than the boat floated past we decided it was time to call it a day! Once again there was abundant birdlife on or around the river, and on a daily basis new birds I hadn’t seen before, would fly into the tree next to our site. The drive past the tip was always interesting as it would be mobbed by raptors, especially black kites, looking for scraps of food. The station has plenty of bushwalks too, with several going from the station to nearby Mt Baldy. We explored Bindoola Falls and billabong, a short 16km drive back up the Gibb River road. 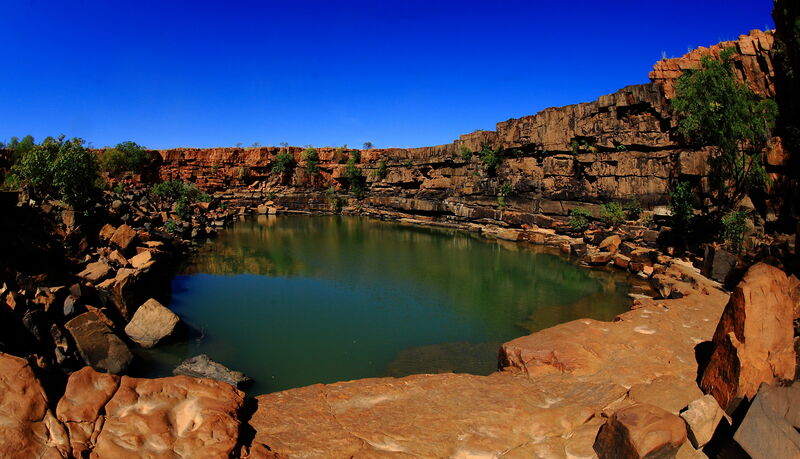 A very short walk takes you to the cliff overlooking a pool inhabited by freshwater crocodiles. We saw a couple of very small ones, then decided to go for a swim as it was a hot day and climbed down the cliff for a refreshing swim. The freshwater crocs sank beneath the water and we didn’t see them again. Oscar threw snail shells into the water to attract archer fish and sooty grunter.